UPDATE: Windows 8 UI named Immersive and will have built in PDF reader and support for cross platform applications. 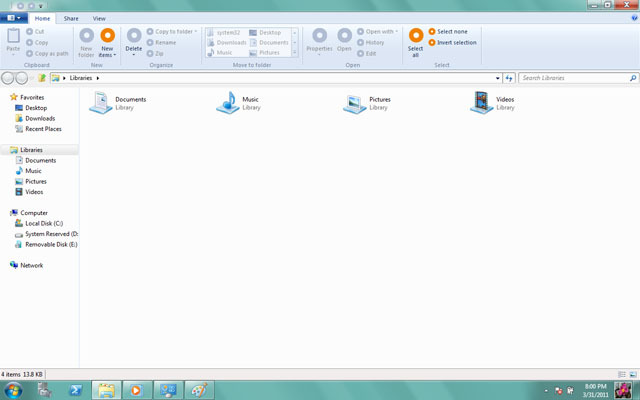 Some screenshots of the successor to Windows 7 - Windows 8 - has been leaked earlier this week. According to the leaked screen shots, it looks the welcome screen has been heavily inflienced by Metro UI, which first made an appearance in Windows Phone 7. The Windows explorer has also got a lot of new stuffs - mainly the inclusion of ribbons. Ribbons was first introduced in Microsoft Office 2007 and in Windows 7, it was used in other applications such as Paint, WordPad etc. The Ribbons UI makes it possible for users to notice features much more easily than the old menu based system. No doubt some people will complain about the change. However, I believe that the Ribbon UI is quite a good and refreshing replacement for the old menu based system.